The Tumas Fenech Foundation for Education in Journalism (FTFEĠ) sponsored the 16th Gold Award, presented during the 23rd Malta Journalist Awards, held earlier this month. President Emeritus Edward Fenech Adami, who chaired the judging panel for the Gold Award, which was also composed of Anna Bonanno and Laurence Grech, gave the motivation praising the latest recipient of the Gold Award, John Inguanez. Mr Inguanez spent the first decade of his career in print journalism before moving to the national broadcasting station where he held several senior positions, including Head of News, Head of Radio and Head of Archiving, over a period of 30 years. 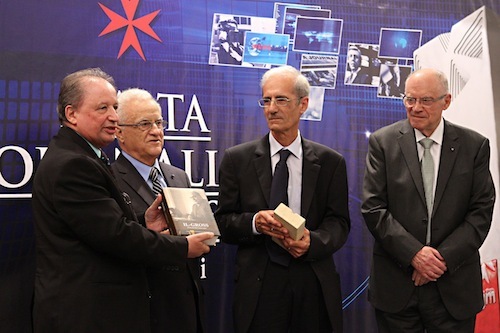 Apart from receiving the Gold Award trophy, Mr Inguanez was also presented a copy of the latest publication of the FTFEĠ, Il-Gross – Il-kontribut letterarju, on the father of President Emeritus Mifsud Bonnici and his brother, Chief Justice Emeritus Giuseppe Mifsud Bonnici. The other recipients of the Gold Award, first awarded in 1998, were: Fr Joe Borg, Anton Cassar, Frank Attard, J.G. Vassallo, Anthony Montanaro, John Manduca, Charles Grech Orr, Paul Carachi, Paul Saliba, Lino Cassar (who passed away last year), Dr Joe Micallef Stafrace, Lino Spiteri, Victor Aquilina, Michael Schiavone and John Micallef (Roamer).